1. Mugham improvisation in the mode Shushter; 2. Tesnif & Mugham Deshti & Tesnif; 3. Tesnif & Mugham Kharij Segah; 4. Folk song Kuchelere Su Sepmishem & Imugham Bayati Shiraz & Tesnif; 5. Tesnif in the mode Shur & Mugham Dilkesh & song 'Tez Gelsin'. Musicians: Gochag Askarov, Aliagha Sadieyv (tar), Elnur Mikayilov (kamancha), Shirzad Fataliev (balaban), Kamran Karimov (nagara), Shahriyar Imanov (ud), Chinara Mutallibova (qanun), Usameddin Azizov (bass nagara), Fariz Dadshov (gosha nagara). Long after the aroma of spring jasmine covers the city, Baku, the capital of Azerbaijan, washed by the Caspian Sea, bursts with a medley of colors in parks and gardens. When the cold Khazri wind gives in to the warmth of the southern wind Gilovar both sweeping the streets of this windy city, when under the luminous sun the lush ornamented carpets hang over windows and balconies to dry, when the aura of dry desert sand meets the oily whiff of the Caspian Sea, the air, intense, ringing, becomes inseparable from the voice of the singer - high-pitched, densely ornamented, inseparable from saturated colors, fragrance, and the sounds of Azerbaijani spring. Gochag Askarov, in his thirties - an age traditionally considered very young for a mugham singer - his voice, dedication, the style he fostered have been respected in Azerbaijan and known in East and West. Born in the Kharabakh Mountains, an area historically known for legendary Azerbaijan singers and instrumentalists, teenaged Gochag and his family along with many others were displaced in the wake of the territorial conflict and war between Azerbaijan and Armenia. In Baku, while working to contribute to his family in exile, he studied vocal at the Music College and later at the National Conservatory. The status of a traditional musician in Azerbaijan as elsewhere in the oral improvised musical domain is linked to his/her masters' lineages. Askarov studied with a master of masters, one of the most influential mugham teachers, Arif Babayev. Askarov also tells about learning from the bulbul (nightingale) of the East, Alim Gasimov. While not launching the head-spinning nerve-tingling zangula (vocal thrills, ornaments) of Alim, Gochag fosters his distinct melodious sensibilities, his pensive exploration of each mugham lyrical property. From the first moments of Askarov's performance, an informed listener recognizes the precious style of Kharabakhi singing - a high range, intense, ringing quality. The air reverberates as he leaps to and holds a single note that is never single but enveloped, emerging within endless ornament. His voice also conveys poignant sadness. 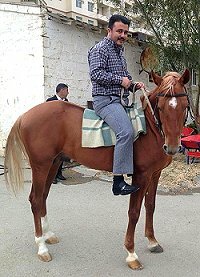 Askarov tells me that he feels connected with his birthplace when singing mugham and when riding his favorite Karabahi horse (photo, right). The Sacred World of Azerbaijani Mugham consists of five tracks and explicit notes in English, both indicating that the recording is designed for a European audience. Recognizing that a traditionally long performance of a single mugham requires informed ears, Gochag instead gives a taste of different mughams, from a dramatic Shur to a 'bride-mugham' Bayati Shraz, a sad Shushtar and a beloved light Segah. In every track, the singer frames the central rhythmically fluid mugham improvisation with metrical pieces - tasnifs. His mugham improvisation draws on gazals of classical poets such as 14th century Nasimi, 16th century Fizuli, and 20th century Vahid. Popularizing Azerbaijani classics, Askarov also uses popular folk tunes and composed pieces in his tasnifs. The recording also introduces the sound of major Azerbaijani instruments. While mugham performance is typically accompanied by lute-like tar, spike-legged fiddle kamancha, and frame drame daf, the instrumental palette in this recording is extended by three nagaras, double-headed drums of different sizes 3, a double-reed balaban, a pear-shaped ud, and an Azerbaijani zither, qanun. Shirzad Fataliev, playing balaban, is well known for his performance in Yo Yo Ma's Silk Road. Qanun is often played by a female, in this case Chinara Mutallibova. 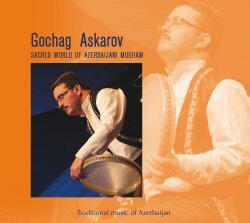 The Sacred World of Azerbaijani Mugham contains no photographs, showing only the soloist on the cover. The color scale of recording and booklet is a composite of different hues of yellow, golden, orange - which together with the voice of the singer reciting mughams, at least for me, evokes a sunny warm day in Baku. I never avoid an opportunity to write about Azerbaijani mugham, especially in the case of such a divine singer and rich recording. Professor of Ethnomusicology, Northwestern University. Specialist on Azerbaijani music, Middle Eastern cultures, Russian opera. Author of several books and dozens articles in several languages.